There's a reduction in the price for the 33.83m motor yacht Sudami as John DeCaro of All Ocean Yachts sends news of a $250,000 price cut, the sixth reduction since she came on the market in April 2009 asking $9.295 million. Sudami was built by Brazil’s Inace yard in 2007. ABS classed and MCA compliant, her interior design is by Michael Kirschstein. This superyacht accommodates up to 12 guests in a master, two doubles and two twins along with two Pullman berths and has a 4,000 nautical mile range at her cruising speed of 10 knots. 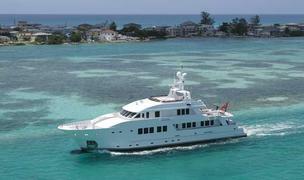 Sudami is now asking $8.295 million.